I've seen this awesome pic of collecting rain water and I told myself, why not? The collected rain water could be use to water the plants, wash the car and clean the garage and it can even be use to flush the toilet. That could save us a lot from water bills! These plastic water containers are covered, so we could be assured that water would be kept clean and would not attract mosquitoes. Water could be collected from the container through the installed water hose. I think that would save us a lot of time and effort. Dito sa Panglao, uso ang mga malalaking water tanks na ginagamit pangkolek ng mga tubig-ulan. Some are concrete, some are plastics and some are metals. Before the water tank here in the church was also used to collect rain water. But it was stopped because according to the previous dwellers, the water was also used for bathing and it cause them skin diseases. I guess there should be a separate tank which will only be used for watering the plant, motor wash, cleaning etc. 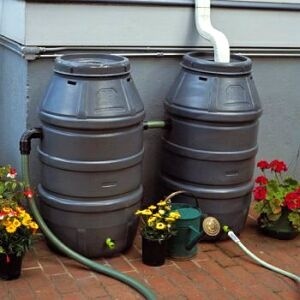 This a nice way to save water and it will really save lots of money.